Further to the successful inclusion in the shortlist of European Network of Transmission Operators (“ENTSO-E”) Ten Year Network Development Plan (“TNYDP”) 2016 (November 2015), TuNur has now been included in the 2016 Executive Report of the TYNDP. The TYNDP 2016 includes 200 transmission and storage projects for a total of 150 billion euros. Each project is assessed notably with regard to its impact on markets, security of supply and climate. The TYNDP 2016 explores the possibility of a power system where 80% of the emissions will be cut by 2030. The 2016 edition of the 10-year network development plan (TYNDP) builds on the 2014 edition and offers a view on what grid is needed where to achieve Europe's climate objectives by 2030. ENTSO-E is helping to build the world’s largest electricity market, the benefits of which will be felt by the whole energy sector and also by Europe’s overall economy, today and in the future. The network represents 41 electricity transmission system operators (TSOs) from 34 countries across Europe. ENTSO-E was established and given legal mandates by the EU in 2009, aiming at further liberalising the electricity market in the EU. The projects included in the final TYNDP shortlist will be eligible to apply as Project of Common Interest (“PCI”) 2017 to get regulatory and financial support from the EU. 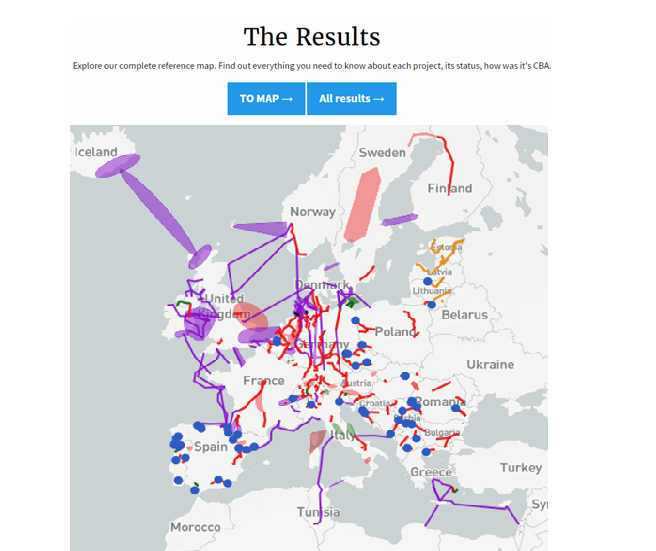 These projects may benefit from accelerated licensing procedures, improved regulatory conditions, and access to financial support for both construction and development from the Connecting Europe Facility (CEF). TuNur is a solar export project from Tunisia to Europe. It aims to develop the first utility-scale solar export project between Tunisia and Europe. As a first stage, the project consists of a 250MW CSP Tower plant with molten salt storage with a dedicated HVDC transmission line from the site, landing in Malta. 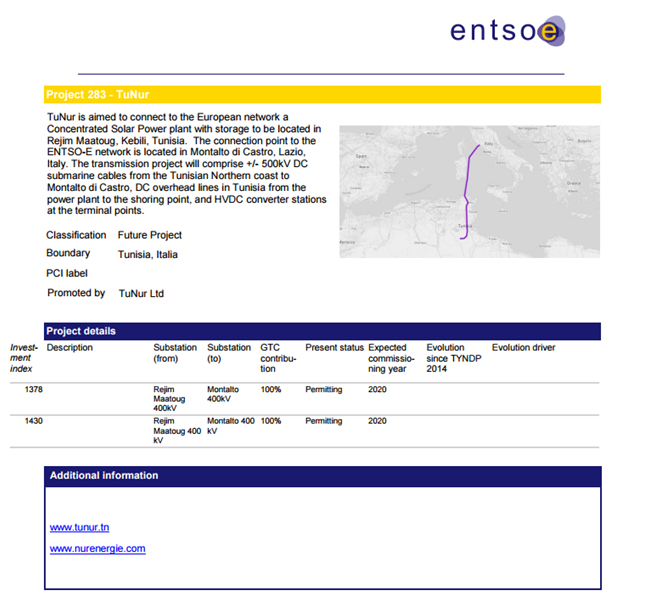 As a second stage, the project consists of 2,250MW CSP Tower plant with molten salt storage on the same site with a dedicated HVDC transmission line from the site, landing North of Rome, Italy. Once landed in Italy 9,000GWh per annum of low carbon dispatchable power will be transported to off-takers across Europe. The project will contribute significantly to the decarbonization of the European grid by opening a new energy corridor between North Africa and Europe, purposefully built for the transportation of solar energy from the Sahara desert to the European grid. At the same time the project will provide a strong stimulus to enhance the Tunisian economy and further its path toward sustainable growth. Nur Energie is an independent solar power plant developer focused on significant climate change mitigation by opening new energy corridors. Nur is developing utility scale concentrated solar power (“CSP”) and photovoltaic (“PV”) projects in Southern Europe and North Africa that are capable of producing low carbon, base load power at competitive prices, all whilst generating significant socio economic benefits within the regions it develops in. Nur currently has over 2,200MW of under development in Greece, Morocco, Tunisia and France.